She's fierce, she's transparent, and she's in tune with the needs of millennials — because she is one. On election night, when I read for the first time about Alexandria Ocasio-Cortez, the youngest woman in history to be elected to serve in Congress, I was immediately drawn to her personality and the ferocity with which she fights for justice and the things she believes in. Ocasio-Cortez grew up in the Bronx, and it's the district she'll represent in Congress. She ran her campaign on the platform of fighting for economic, social, and racial justice. She's a strong supporter of the LGBT community, gun control, Medicare for all, and immigration reform. Many people were quick to oppose her candidacy and beliefs, partly because she ran as a Democratic Socialist. The word socialist scares a lot of people, and it makes a lot of people quick to dismiss any ideas surrounding the concept or the people pushing them. But she didn't care, she knew that attaching that to her campaign would bring backlash and a lack of support, but she did it anyway because it accurately represented who she is and what she stands for. And it paid off. She defeated a 10-term incumbent for her seat in the House of Representatives. You might not agree with her ideas or her platform, but Ocasio-Cortez has shown herself to be intolerant of inequality and bigotry and is unafraid to speak out against injustice and perceived corruption in our government. An attitude like hers is exactly what our Congress needs in this Donald Trump, hatred-filled era. She also handles attacks from Democrats and Republicans alike on a daily basis. Some call her radical, inexperienced, and naive. She's even been called out quite a few times by our nation's president, but she handles it with the grace and dignity we could only ever hope to see from the likes of the Trump administration. The reason her and her ideas are consistently bashed by her fellow (male) Congressional leaders is, I believe, because she's a powerful woman with proven support who is challenging the status quo. She's got the numbers and the power now that she's been elected, and that power is threatening to the men in Congress who are used to getting their way. She's asking the tough questions, questions a lot of politicians are afraid to ask. She's challenging the decades-old ideas being used to justify inequality in this country and she's encouraging others to do the same. She's everything that Trump, and those who support him, fear. And the country is starting to notice. 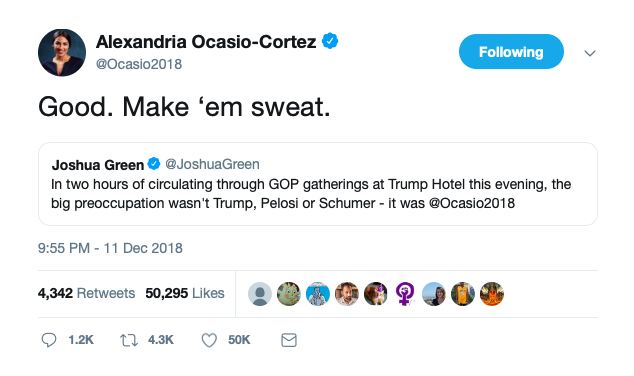 Alexandria Ocasio-Cortez is humble, but she's also not afraid to make her achievements known when she needs to. She's gracious, but she fights with fire for the rights she believes New Yorkers, and Americans, deserve. She's not sitting in the pocket of large corporations, taking their money and pushing their agendas. She's here to fight for the unheard and underrepresented. One of the best things about Ocasio-Cortez is that she's focused on looking out for millennials. For preparing our economy, our education systems, and our justice systems to be taken over by the next generation. She knows what millennials are going through, what our struggles are, and what we need in a governing body because she's one herself. She's active on social media because she knows that's where young people today are putting their complaints out into the world. She's engaged and she's listening, and she does so on a level we haven't seen from Congressional leaders lately. She embodies the fresh-faced — but clearly capable —young, new ideas that America desperately needs. She's zeroed in on climate change, racial justice, and many other issues that we've let slip through the cracks for so many years. Despite every obstacle or opposition she's been faced with, she's proven that she's not here to represent from the bench. Day after day she's out in her community, and communities all across the country, listening to what people need and sharing her ideas on how to get them there. You may be thinking that I'm too naive to have such high hopes in one politician, and maybe you're right. But maybe, just maybe, she'll be successful in her plans for the Bronx and for our country and finally be able to create real change. I think she'll have the continued support of the next generations and, who knows, may even break the status quo in the way Congress operates. She may not be my representative, but with the work she's doing and the attitude she's doing it with, she's making so many districts outside her own proud. Alexandria Ocasio-Cortez is proactive, bold, and fiercely fighting for the next generation. She's calling attention to ignored issues and doing so with grace and optimism. She's exactly the type of leader that we need, and that we deserve.